This afternoon we candled the eggs in our incubator to see if chicks are developing inside them. In 11 of the 12 eggs we could see chick embryos growing and red veins within the egg. We could also see the air sacs within each egg. We have put the 11 eggs back into the incubator and we hope that the embryos will continue to develop into chicks. We had great fun egg rolling down the bank! We have come back from the Easter holidays to discover that the Classroom Fairy has kept her promise and she has given us some eggs that will hopefully hatch into chickens. We have also noticed that the shape of our tadpoles have changed over the holiday; their bodies are beginning to look more like frogs and they are developing little back legs. The bulbs that we planted last year are now in bloom and the seeds we have planted in the greenhouse have germinated and are starting to grow. We have been brushing up on our design technology skills to create something extra special. We can't tell you what we are making just yet as it's a surprise! We had a fantastic trip to the Forest today. We saw lots of signs of Spring and we saw lots of deer hoof prints too. When we got to the Forest we discovered a note from Wander, the Woodland Fairy. She told us that the terrible winds and sleet showers over the weekend had caused lots of damage to the fairy houses in the woods. Wander told us that Wendy, the Weather Fairy, had missed the weather forecast from Florence, the Weather Forecast Fairy, and so they had no warning of the terrible weather that was about to hit their homes and so that is why it caused so much damage. Anyway, to cut a long story short, Wander needed our help to make some more fairy houses because her and her friends are expecting visitors tomorrow! One of the visitors is going to be our Classroom Fairy. We helped Wander by building 3 new fairy houses for her visitors. The Forest was very muddy but we think that made our Forest trip EVEN better! Today, as part of British Science week, we enjoyed learning about dinosaurs in The Science Dome. The film inside the dome was fascinating and great fun to watch. We even got to handle some amazing fossils. Once again Waberthwaite School is holding the annual inter-class potato growing championships. Class 1 were the winners last year and we intend to retain our title. We would like to point out that we aren't usually 'fair weather gardeners' but during an absolute deluge like this afternoon we occasionally have to garden in the classroom. Our Classroom Fairy very kindly left us some gardening fairy dust to sprinkle on our potatoes to help them grow big and strong. Don't tell Classes 2 and 3 about our secret ingredient!! Since the half term holiday we have had a very special visitor who visits our classroom at night. She comes to see what we have all been up to and we write her lots of letters. She always writes back to every single one of our letters. She leaves our letters next to her little fairy door. Last weekend the Classroom Fairy had been for a walk to look for the signs of Spring (Spring is her favourite season) and she bought us some frog spawn! Since we have started writing lots of letters to the fairy we have become more confident writers and our writing has improved dramatically. Thank you for your help Classroom Fairy! Today we learnt about Shrove Tuesday and we cooked some pancakes to share. We are the first class to win the new prestigious prize of having 'Sam the Attendance Bear' in our class for a whole week. Well done Class 1 for being the class with the highest attendance this week! Hooray!! During our dinosaur topic we read the book “Dinosaurs love underpants.” We thought it was really funny and we decided to make our own underpants for the dinosaur. We think they have turned out brilliantly. Many of the children in class 1 are dinosaur enthusiasts and we all love getting creative too. We aim to use the children's interests to form the basis for our curriculum planning so over the last week or so we have been designing, modelling and painting a dinosaur land WITH REAL ERUPTING VOLCANOES! Today we added some special lava ingredients to our creation and the results were spectacular! Class 1 enjoyed a fantastic trip to Muncaster Castle today in perfect Autumn weather... We had heard a rumour that fairies live in the enchanted woodland areas so we listened carefully for jingles and searched the grounds for evidence of fairies... A friendly fairy, called Autumn, left us some notes to find on our trail AND some yummy treats! After our fairy trail we enjoyed hunting for different coloured leaves to make an Autumn Rainbow as a thank you to Autumn the Fairy. We had a walk around the castle grounds and Year 1 were fantastic historians and able to point out different facts about the castle from their history lessons. A special thank you to Miss Ward for organising such a lovely day out for us. This afternoon class 1 enjoyed a STEM (Science Technology Engineering and Maths) workshop. We had great fun learning how to program Bee Bots. We really enjoyed our first session of the year with Zozo! 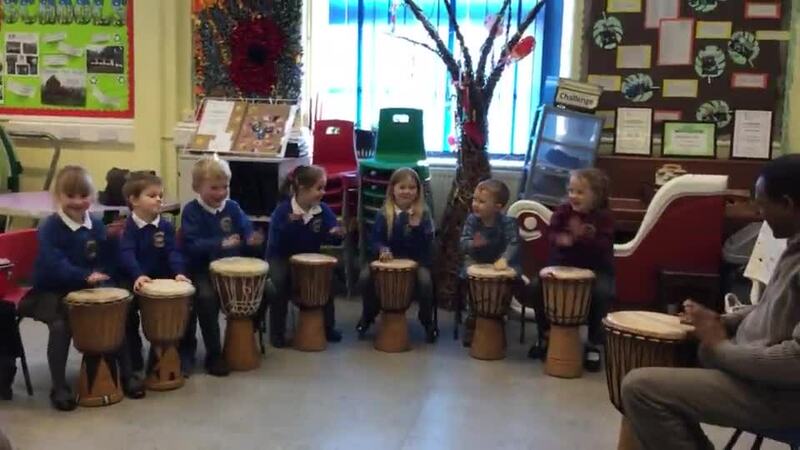 This afternoon we have been drumming, singing and dancing. It isn't just the class 1 pupils that have grown over the summer holiday! In Class 1 we have a class reward system where children earn pompoms in order to reach each reward; they chose their class rewards at the beginning of the year. Everyone in class has worked extremely hard and contributed towards our third reward: PJs and Teddies Day! We had a BRILLIANT beach day today!! 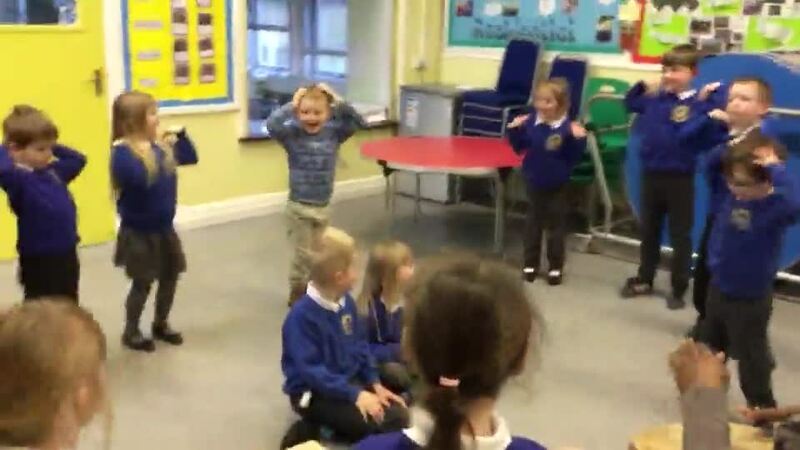 Today we practiced crossing the road safely and we played a traffic light game with our musical instruments. We helped raise money for the road safety charity Brake. Thank you to Mrs Brown, Sharon and Denise for baking such delicious cakes and biscuits and running some competitions; it was lovely to have you all in school this afternoon. Congratulations to Class 1 pupils who have completed their Kidsafe course. On Monday Year One and Reception were lucky enough to make their own bread buns with Mrs J for our teddy bear's picnic ! We learnt lots of new skills including how to knead bread and how to make a sandwich. We were then able to take our teddy bear's outside and have a delicious teddy bear's picnic in the sunshine ! Class 1 have had a fantastic day at Tree Top Nets! Reception and Year 1 are learning lots of new skills baking with Mrs J every Monday morning. We are REALLY enjoying baking our own pudding; delicious! Today we even surprised Miss Ward with a birthday cake! This afternoon Class 1 spent an amazing afternoon in the company of some VERY sweet hound puppies. We learnt a lot about the hounds and how the kennels operate and got to make friends with lots of beagles. We would all like to thank Michael, Miss Dixon, everyone at the kennels and all of the hounds for making us feel so welcome and for a brilliant afternoon. Key Stage 1 are studying weather in different seasons. 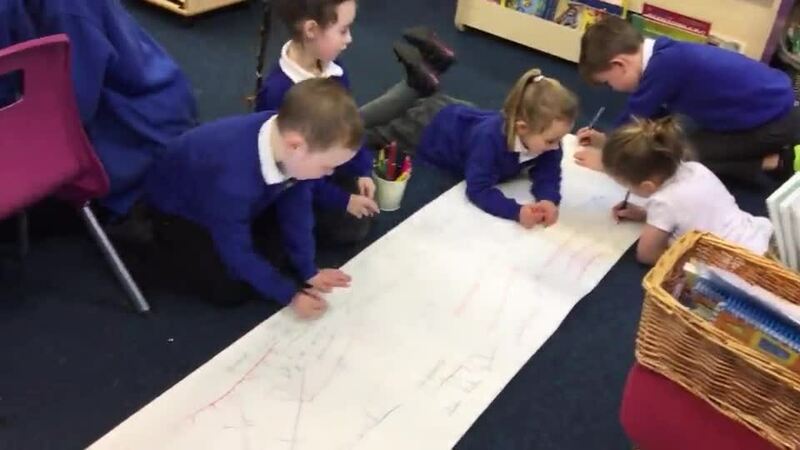 We were able to use our knowledge of the countries in the United Kingdom (and their capital cities) to draw our own map and discussed the most likely weather in Spring time! Thumbs up for our Gardening! For some more pictures of our horticultural antics please have a look at the 'Gardening Page'. Reception and Year 1 were very excited that it was their turn to bake this morning. We baked some fairy cakes (we thought our fairy might like them)! The children were all fantastic at encouraging and supporting each other. Some of us in the class are expert bakers so we were able to pass on our expertise and assist others in cracking eggs and spooning mixture into cake cases etc... a real team effort! Mrs J kindly helped us to add some icing and sprinkles and has kindly offered to bake with Class 1 every Monday after half-term. Class 1 are VERY excited as will be helping Mrs J make our own pudding to eat at dinnertime! Our amazing recipes will be put in our very own Waberthwaite Recipe Book...how exciting! Today the Nursery children made some delicious cakes to have for pudding at lunch time. The bakers each got to take some home as well. Burgundy jumpers all round for the tadpoles! After a tremendous effort they have done it.... we have oodles of froglets! It's just about time for the little frogs to return to the great outdoors. We've enjoyed having the frogspawn in the classroom and have learnt lots as we've watched it transform and develop. We had a brilliant time at The Beacon Museum, Whitehaven this morning visiting the Nick Sharratt exhibition. It was a really great hands-on exhibition. We had a fabulous time this afternoon! Our Classroom Fairy had overheard us talk in class about going for a nature walk to the forest to look for signs of Spring. 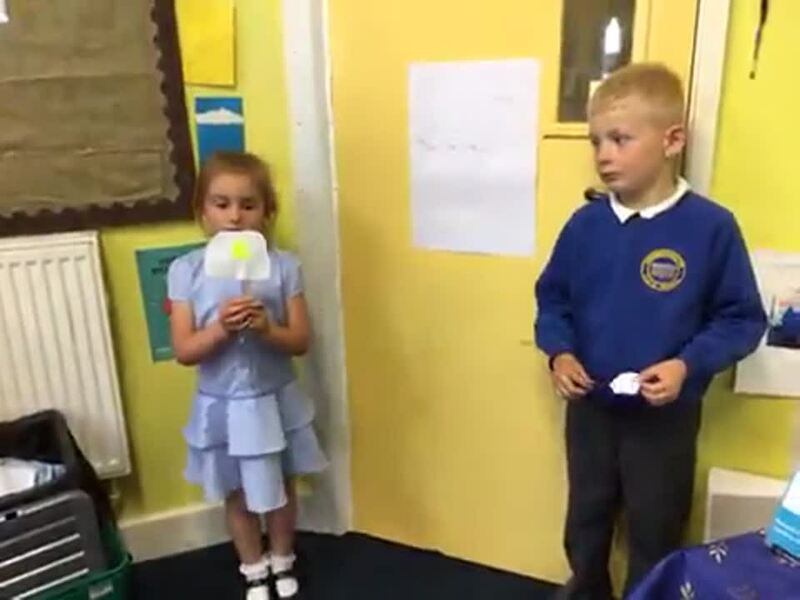 The Classroom Fairy spoke to her friend The Woodland Fairy about our plans. We were so excited when we got to the forest because the The Woodland Fairy had left us a note AND set up an Easter Egg hunt for us! We had a great time getting covered in sticky mud and yummy chocolate. Thank you to both the Fairies for organising such a great treat for us. In Class 1 we practise our fine motor skills and letter formation (pre-cursive for year 1) daily whilst listening to music. Spring has Sprung in Class 1! The 2018 frogspawn is in situ and it's developing particularly fast this year; if it carries on changing this fast we'll have wriggly tadpoles next week. We have been busy filling bird feeders and putting them on the NEW bird feeding station in the nature area AND we have been busy planting our PRIZE WINNING potatoes! We have decided that Class 1 is definitely going to win the inter-class potato growing competition this year. Our growing secrets are closely guarded; Class 2 have already been spying on us and we have been trying our best to see what they're up to with their potatoes. It's getting rather competitive!! David Pickering from the United Reform Church visited us with Reverend Hart. David had some knitted characters from the bible. He had Jesus and 12 other characters. These 12 individuals were Jesus's disciples. We learnt that Jesus had a big job to do and so he asked for help. The 12 disciples who helped him were called Peter ( a fisherman), Andrew, Thomas, Matthew (sometimes known as Levi), Judas, Simon, James the Greater, James the Lesser, John, Bartholemew, Thaddeus and Philip. Jesus said to them to come and follow him, they learnt the stories of Jesus and helped Jesus by telling others. We concluded that however old you are you sometimes need help so you work in a group, as a team, just like Jesus and his disciples did. Mrs Cummings was so impressed that all of Class 1 had made such an effort we ALL chose a book as a reward. Every Friday we take part in Helicopter Stories, which involves story scribing. I will scribe word for word a child's story (unless they choose to write it themselves or help write it) and then in the afternoon each member of Class 1 helps to act out the stories. It is truly magical to watch their words come alive as part of their story... a firm favourite in Class 1. 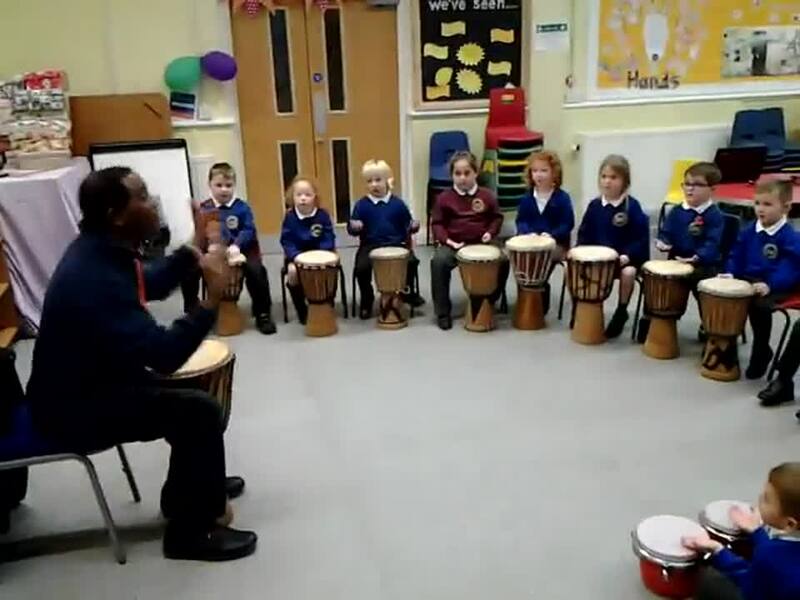 We have had a fantastic afternoon drumming with Zozo. 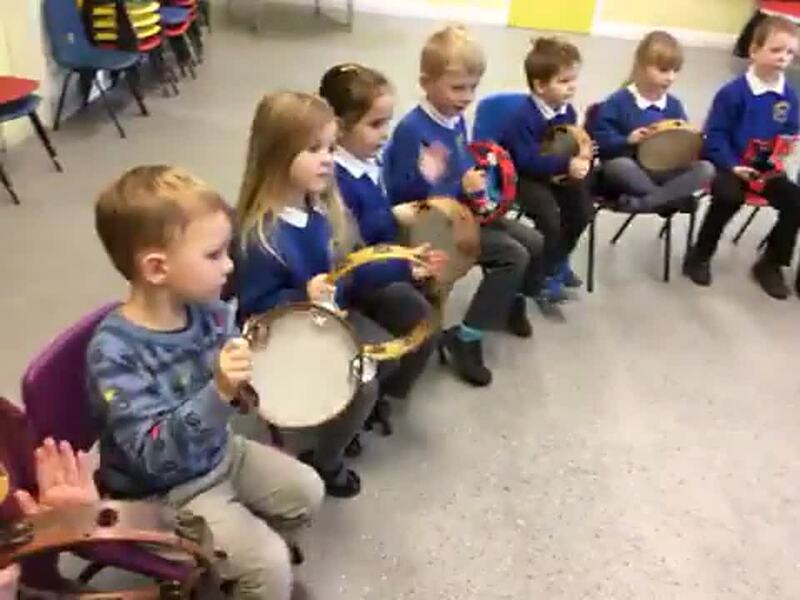 We are learning so many new songs and our rhythm is improving! A HUGE thank you to our most recent Secret Readers! We just love guessing who is going to be behind the door. Class 1 have started creating some yummy food using Phunky Foods recipes... Year 1 will soon be coming up with their own ideas about what they would like to create. The PhunkyFoods mission is to improve the dietary and physical activity habits of young children (aged 2-11 years) across the UK. Rapid increases in childhood obesity prevalence means that we must help empower children, alongside their families and communities, to take control over their wellbeing to enable them to live longer, healthier and more fulfilled lives. The PhunkyFoods Programme aims to help early years settings and primary schools to deliver a whole-school approach to healthy lifestyles and to engage with all pupils, and their families, in promoting tangible health behaviour changes in a fun, lively and positive manner. 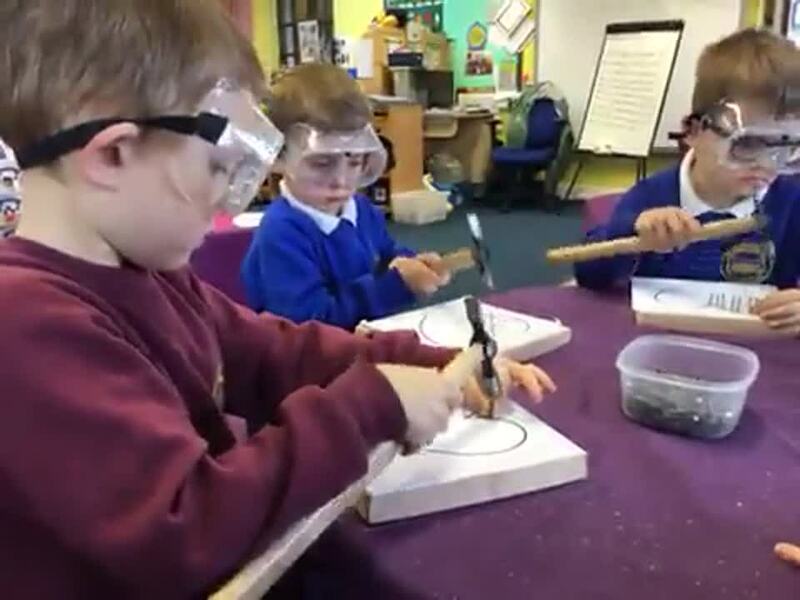 Take a look at our pictures showing how much we concentrated whilst chopping, scooping and cutting! We REALLY enjoyed eating our delicious strawberry cheesecakes! This week we have had some more fantastic Secret Readers... Thank you to Maisie's Mum and Mrs Kirky (Esmae's Mummy). Thank you to Mrs Kirky who left us the book she read. We thought it was great fun having extra visitors in and when they sneezed and sparkly tinsel went everywhere we giggled and giggled! It's sooo much fun having secret readers in Class 1! Today we went on the Santa Express! We all had the BEST time and even met Father Christmas. "There's my Mum" "It's Mrs J" "It might be Mrs Cummings"
Thank you to our first Secret Reader... Olivia and Taylor's Mummy! We loved listening to you read "The Tiger Who Came to Tea" and hope that you will come and read to us again soon. I wonder who will be our next Secret Reader? What will you wear in Antarctica? This morning a little bit of Antarctica arrived in our classroom. We were absolutely freezing in Antarctica so made a list of everything that we are going to wear in Antarctica! We had sooo much fun baking cakes on Thursday ready to sell today! I'm sure all children and staff will agree that they tasted just as scrumptious as they look. Year 1 helped to count all of the money raised and we are thrilled to have raised over £45! Thank you to everybody who bought one of our delicious cakes. In Class 1 we all take part in phonics activities from Phase 1 to Phase 5. We have so much fun learning different phonemes and graphemes as well as trying to read and spell tricky words. Lacey was able to show us a map of the world and the UK in the planner she had brought in for Show and Tell... We were amazed that Waberthwaite is sooo small and there are so many other places to visit. If you visit anywhere please send us a postcard (especially if you visit somewhere in the UK) so that we can add it to our board. Votes for our Class 1 school council members have been counted... Thank you to our Chair, Secretary and Vice-Chair who organised a smooth voting process... Congratulations to our new school councillors in Class 1- Max and Maisie! What a fantastic year we have had in Class 1! Thank you so much to our children, staff and parents who have all worked so hard to create a thoroughly amazing, enjoyable year. I have updated our timetable and added our new planning overview for Autumn (see Curriculum Overview tab). Have a lovely Summer! 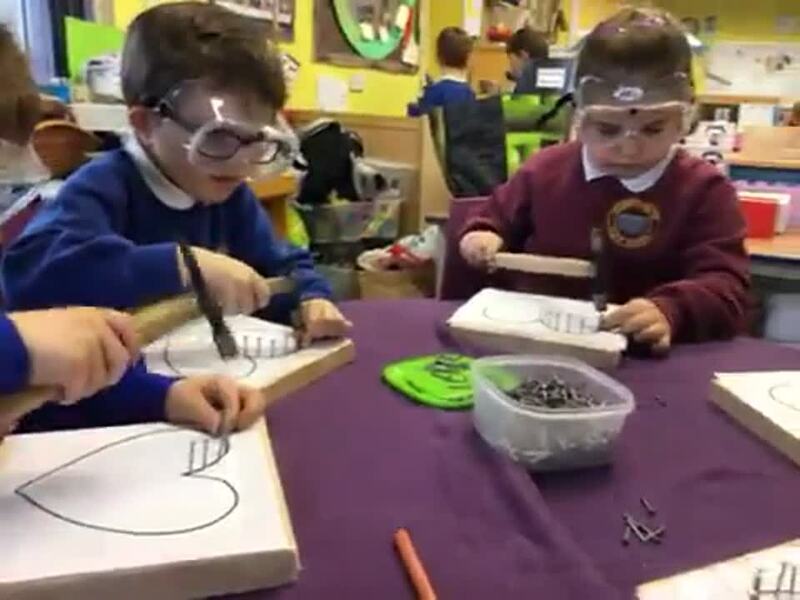 One of the best things about working in Class 1 is being able to encourage children to take risks and learn through their own ideas. A box of dressing up items has recently been found with a lovely white dress being rather popular. One of the girls asked if we could have a wedding... in the blink of an eye we had children designing and writing invitations, making flowers, discussing how to set up the hall like a church, including symbolic items such as the bible. We, of course, had to have an after party! Devon wrote a playlist and Max amazed us with break dancing skills! Another memorable, learning in the moment session in Class 1! Our chicks have really grown. They are getting a little bit big for class one now and so they are moving house and will spend some time at Miss Ward's house. Once they are big enough to be outside we are hoping that some of them will come back to school to live in our outside chicken coop. Quick chick update...we now have 8 beautiful little chicks. All of them are eating well, drinking well, sleeping well and they've all had a great day at school! Class 1 are very proud of all of them. Yesterday the eggs in our incubator started to hatch. We now have 5 healthy little chicks! We have all really enjoyed watching them hatch and are looking forward to taking care of them and watching them grow up. We will add more photographs to our webpage over the next few days. This afternoon we spent some time in the garden planting lots of seeds. Class 1 have their own raised bed this year and we are going to grow lots of beautiful flowers that attract pollinating insects such as bees to the school garden. We used hoops to help us mark out where we were going to plant the various seeds. Thank you all for coming. We had a great time. The play dough proved to be very popular - it's 2 cups of flour, 1 cup of salt, 1 cup of water and a splash of food colouring if you fancy making some at home. What are fabulous time we are having outside. We have been using the tyres to create cars, buses and all sorts of wonderful transport! We really make a fabulous feast in the mud kitchen, come and join us for a wormy ice-cream or a daffodil cake sometime! A race car rally was held in the sand pit this afternoon and we were able to write down the names of our cars and judge who was 1st, 2nd and 3rd; a super afternoon. Thank you so much to all of our lovely adults who were able to join us today. I hope you found our phonics information session useful this morning. We have had so much fun showing off our phonics activities from Dough Disco to using our phonics sound mats to write about tadpoles! A big thank you to you all for engaging so much with the morning! Class 1 have been taking part in Kidsafe sessions with Mrs Geer and KS. We have really enjoyed taking part in them and have learnt so much about what we can do if we have yukky feelings. A Phonics Information Session is being held at school on Friday 17th of March. A brief information session will be held in the hall followed by a phonics based "stay and play" session in Class 1. This will start at 9:15 straight after our praise assembly. The children and staff are really looking forward to sharing our fantastic phonics sessions with you! This week we have had some rather tiny, wriggly guests! We are really enjoying watching them grow and change every single day! What an amazing time we have had at the Dock Museum! We had a fantastic time playing outside, a tour of the Dock Museum and the thoroughly enjoyable Boat Builders Workshop. We were able to identify submarines, make some boats, play with the small world pirate area and loads more! A huge thank you to class 1 who joined us this afternoon to make some fierce dinosaur collages! We all worked really hard and had lots of fun - take a look at the photos on our class page! Not only was it a little bit fiddly at times, it was also a bit messy! Please join us again soon for more fun! Another fantastic Drumming Session with ZoZo....smiles all round! Thank you to our class 3 ICT experts. You did a fantastic job of explaining to us how to programme our Bee-Bots. Miss Sharp and Miss Ward could not have put it better themselves! This afternoon we explored the fleece of one of Mrs Jenkinson's Jacob sheep. We managed to work out which were the front legs, which were the back legs and we also found the tail. This sheep had a long tail but Devon told us all about why other sheep have their tails docked to keep them healthy. Richard knew straight away that the fleece was from a Jacob and told us all about the electric clippers that the sheep shearer would have used. We discovered that the fleece was greasy and worked out that this must keep the sheep waterproof; just like a waxed jacket! Bethany commented that the fleece smelt a bit like hand cream which led us nicely into talking about what the lanolin is used for! Maisie told us why we shear sheep in summer when the weather gets hot and we also learnt why some of the black splodges on the fleece had turned a gingery colour - they had bleached in the sun just like our hair does. We each had a handful of wool and noticed that when we screw it up in our fist and then let go it BOINGS back into shape again. Max said that when a sheep lies down it must spring back into shape when it stands back up again. We talked about how air gets trapped within the fleece and this air is heated up by the sheep's warm body and this forms layer of warm insulation to keep the sheep cosy a bit like a duvet. We noticed that the fleece was made up of tiny little hairs. Bethany and Jake were particularly good at gently teasing out a small section of the fleece and spinning it into yarn with their fingers. THERE IS MUCH MORE TO SHEEP THAN MEETS THE EYE! We have now started turning a washed fleece into felt so that we can use it for an art project. Class 1 were very excited to welcome some visitors into our classroom this afternoon. 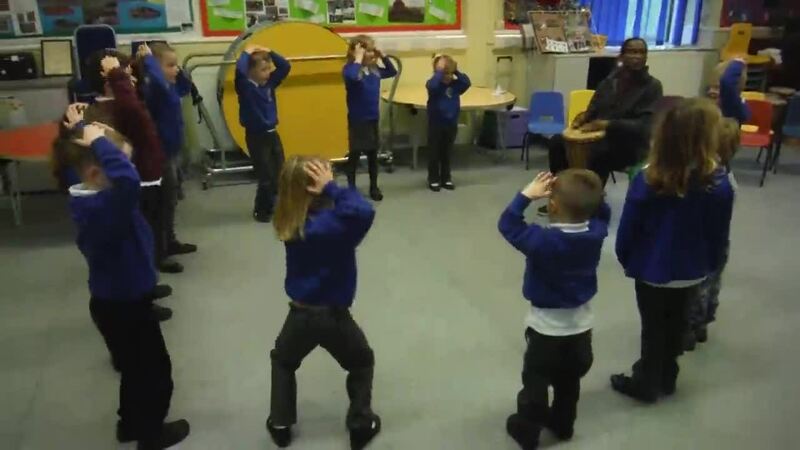 As we are focusing on telling stories this term we invited Class 2 in to help start us off by creating our own stories and performing them to both classes. Each group planned their story, including characters, so that wonderful stories were created with fantastic dialogue and narrative. We had all sorts of stories that included funny cows to magical fairies to terrifying dinosaurs! STOMP AND ROAR! LET'S TALK DINOSAURS! Welcome back after the Christmas break. I hope that you are all well-rested for our Spring Term, we have lots of fun activities in store for you! Have a look below to see what we will be getting up to for this term and an updated timetable so you can see what we plan to be doing each day. Please encourage your children to bring in any books/ items etc that are related to our Dinosaur topic, this will be greatly appreciated! 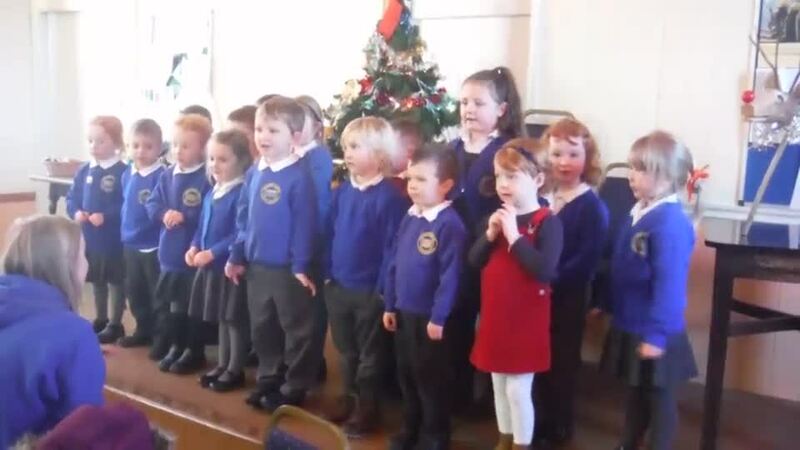 For 150 years the pupil's of Waberthwaite School have been presented with oranges at Christmas by Woodall's shop. This year was no exception. Thank you Mrs Woodall and Mrs Hadwin for visiting us this morning. This morning we worked with willow weavers Steve and Simone to create some willow fish, magic star wands and a wonderful whole school wishing tree. Today we went on the Santa Express. We all had a really great time! 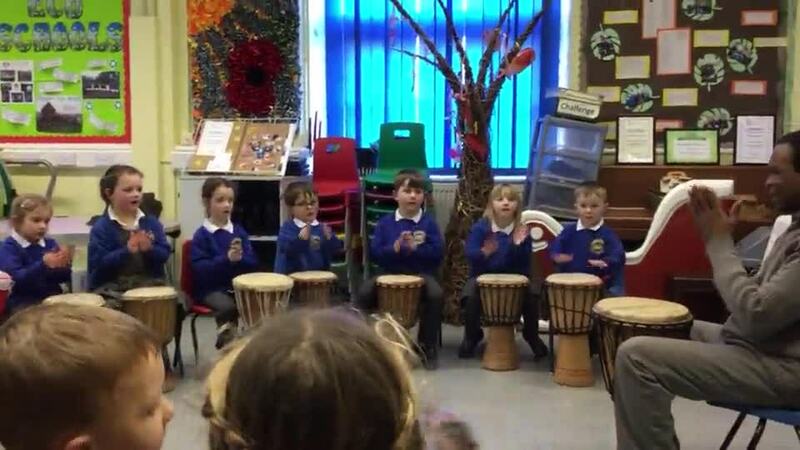 We had great fun this afternoon singing and drumming with Zozo. We hope that you are all enjoying a lovely week off. Have a look below to see what we will be getting up to for this half-term and an updated timetable so you can see what we plan to be doing each day! Just a reminder that PE has now changed to a Wednesday afternoon, instead of Tuesday morning. This afternoon the sun was shining so we had a great time outside. Thank you to Lorna for showing us all how to wash all the germs off our hands. We may need to keep practising; the germ detector found some germs on our hands even after we had washed them! We had such a busy day. First of all we went on a maths trip to the Brown Cow. We focused on the value of each coin and learnt how to select the correct coins to pay for some tasty crisps. We even got some change. A really big thank you to Natasha for helping us with our maths, putting our favourite tunes on the juke box AND giving us all a cup of juice! We picked some tomatoes. Mrs Jenkinson is going to use the red ones to make a tasty pizza topping and the green ones are going to be made into green tomato chutney to sell at the PTA Christmas fayre. Thank you to the tomato sorting team who sorted the red ones from the green one. Our classroom has undergone many changes already this half term and now we are beginning to develop our outside area. Our new mud kitchen looks amazing thanks to Travis Perkins donating a load of chunky wood and screws. We still have wood left AND lots more great ideas so keep an eye on our class webpage for outdoor updates. Today we really enjoyed archery. Everyone had a go; it was great fun! Class 3 have been writing bedtime stories. This morning Ben and Joe came into our class to share what they had written. Both stories were absolutely brilliant and we thoroughly enjoyed listening to them. Thank you boys! Crispin is terrible at forgetting birthdays and needed to buy some presents. This morning in Class One we helped Crispin by showing him some items in our classroom and writing down how much they were worth, so he could go to the shops and buy them. Crispin is now full of lots of ideas! This afternoon we had a very special visitor in class 1. Billie Jo had an amazing time reading us stories, telling us all about herself and building the most amazing house with the boys! Thanks for coming; see you again soon! We made a beautiful harvest wheatsheaf loaf in class 1 this week. 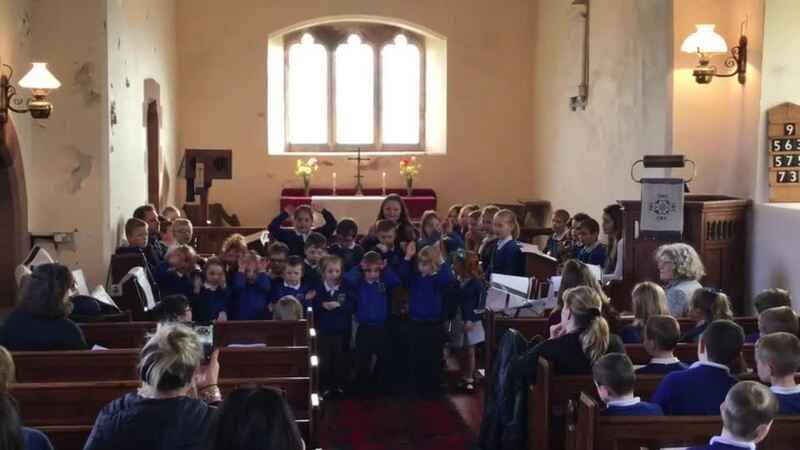 Our fantastic sunflower artwork and harvest loaf looked fantastic in the church for our harvest festival service. Today we baked some cakes with Mrs Jenkinson! Thank you Mrs J, all the extra things you do for us are the icing on our cake! 2,4,6,8 we think maths is really GREAT!!! ..."Not by the hairs on my chinny chin chin!" In literacy we have been focusing on the tale of the three little pigs. We've been memorising the story and retelling it using actions to help us. Today we worked in small groups to retell the story using our little knitted pigs. Miss Sharp and Miss Ward REALLY enjoyed watching the performances they were just perfect! We are enjoying learning and consolidating our phonics knowledge during lots of fun activities. Thank you for your support in helping the children at home, it is much appreciated. Today we painted some beautiful sunflowers! We are all settling in really well and enjoying a busy and exciting timetable in class 1. This is us during one of our daily 'Dough Disco' sessions. I think you can see from the pictures how much fun we are having while we develop our upper body strength, gross motor skills AND develop our hand and finger strength which we need for writing! Have a look below to see what we will be getting up to this term and a timetable so you can see what we plan to be doing each day!